This is a neat vacation home with a spacious wrap-around deck under the pine trees that is cool and comfortable during hot summer days. The home has plenty of room for a large family. The upstairs bedroom is perfect for the kids; the bedroom sleeps six and has its own bathroom. The downstairs has an updated bathroom and two bedrooms. It has an open floor plan and wood throughout providing a cabin feeling. It is the perfect place to relax with the family and enjoy all that Wallowa Lake has to offer. 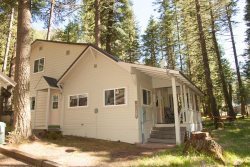 The home is a close walk to the lake and most of the Wallowa Lake activities, including the Wallowa Lake Tram.